Tipai Gourd Rattle interpretation: Analysis of form and function in current usage. A gourd or shaker rattle is an object and even though this activity is goal oriented it will be better to maintain an attitude of non-objective oriented enthusiasm. By this I am referring to the greater value of the path or process in the creative journey and the steps into the culture rather than the final destination or art object produced. Look around at other rattles used by other singers and the types of uses that you desire to associate with. Keep in mind; imitation is the proven and often best type of cultural flattery. In a group oriented society individualism has a minimal role. Focus on the role or use or values that are important to the culture that regularly has rattles as a part of its expression. But, before we start we need to accept this as an axiom: Measure twice, or more, cut once. OK, lets start. Look at the gourd you have selected. Try to determine the shape and balance of the orb. Visualize the handle in proportion to the gourd. What proportions do you visualize? Will it be in balance if it is short, long, narrow, thick, or custom proportions? What size hole will the cut produce? Will you need to step down from the plug to fit the hole or vice versa? Shake a rattle for a couple of hours, non-stop, to determine a handle shape that may feel comfortable to your hand. We still have not cut the gourd. We are still looking for balance. If we achieve this focus, whatever we produce will be centered and in balance. All will be harmonious and still special because we are all special to the Creator. 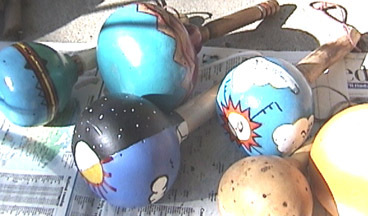 Much of the music that is sung in Southern California, Baja and over along the Colorado River utilizes a variety of rattle accompaniments. One of the most familiar varieties is the gourd rattle associated with many of the variations of Bird song presentation. Not too long ago an opportunity became available to experience and receives instruction from a recognized singer on a variety of steps utilized in the construction of the gourd rattle. In appreciation of the detailed teaching and with all due modesty, here are my interpretations. I hope you find them instructive and in this way we will educate and encourage the greater appreciation of the Yuman and other song styles utilizing the gourd rattle. First steps: Use a small handsaw to take off the stem portion of the gourd and discard it. We might try to anticipate the sawn opening and the size of the wood handle. But, before I get ahead of myself, the next task is the removal of seeds and the pithy material inside the gourd. There are a variety of creative tools, mostly custom made for this messy task. Spread out lots of newspapers to catch the mess. The cleaner the inside the gourd the clearer the sound of the rattle, take your time. Next you might want to judge the outside carefully and remove some of that crusty stuff until you have a completely clean gourd surface. At this point most of us started to work on two steps at the same time. One, for the handle we used willow branches or also acceptable is cottonwood for the wood handle. Two, the cleaned gourd needs to be 'cooked.' Boiling water in a large container (#10 can or large pot) will handle several gourds at the same time, twenty to thirty minutes will harden the walls and bring a crisp edge to the sound of the finished gourd rattle. Also the boiling will soften off the last of the crusty areas and leave it nice and clean. While the gourd is boiling this is an excellent time to whittle the handle to a desired shape and size one end to fit snugly in the opening of the gourd. Rasp, knife, drill and lots of sandpaper will be utilized; also this step is real good therapy for anger management and that new twelve-step behavior adjustment program! When both cleaned gourd and handle are ready, bring together for fit, adjust, and refit. For the next step we need to add some sound-making elements. Preferred are the traditional date palm seeds, cleaned of sand and other stuff. We hear all kinds of stories about how many seeds and why. But what we were told was to put them in, insert the handle and shake it, if it sounds like too many, remove some, too few, add some, it worked for us. Next, the handle needs to be glued (White, Elmer’s, Carpenters, etc) to the gourd. Tilt the rattle so that none of the seeds will be glued at the same time. If it is still too loose it may be necessary to adjust the handle with layers of masking tape for a snug fit and then glue. Let set, sand, and paint, in the regional style you are representing, both or more rattles. Keep in mind tribal generosity, decorate the best one to give away, make up a real good story to go with it too. Enjoy swinging those gourd rattles and singing the many styles, (twelve to fourteen) of traditional Southern California songs. See what you think and let us know your opinions. Have great fun following Native American custom and tradition.